According to the legend, the ladies of Theus, famous throughout the region for their exceptional beauty, gave themselves, one evening of dance, to a frenzied last sarabande. Capped with their fine hats, they were still dancing when the church tower sounded the stroke of midnight. A diabolical yell echoed through the valley and the inhabitants only found these huge capped pillars because the devil had forever frozen the young women. Theus, a small village with a hundred inhabitants, is famous for its ladies stone. 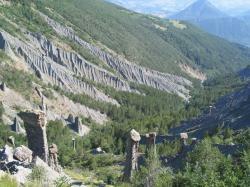 The village of Le-Sauze-du-Lac, near Savines, is also renowned for its capped columns. 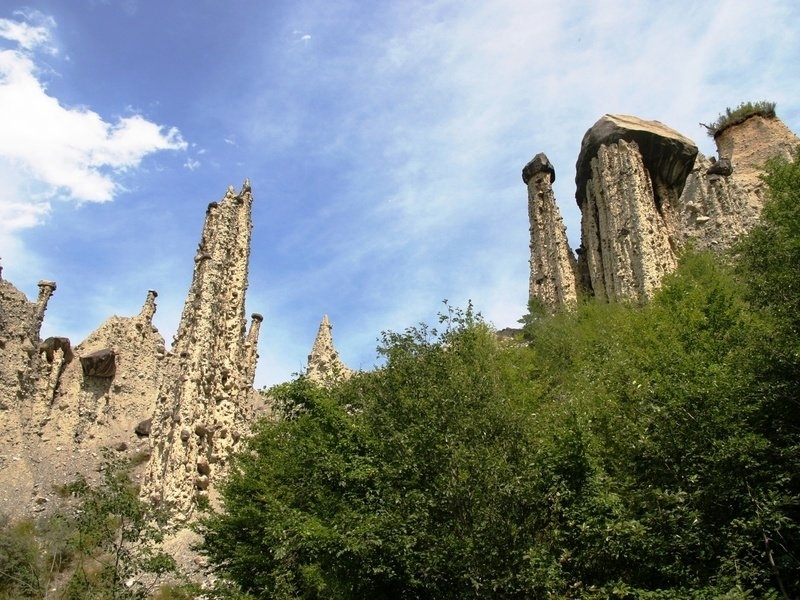 These gigantic natural obelisks, also known as fairy chimneys, are very numerous between the Serre Ponçon lake and Remollon. It is the largest concentration of French fairy chimneys, a small-scale Cappadocia. The geological explanation is simple : the field, mainly composed of clay and weak rock, crumbles and the waters of three rivers passing nearby override them only to reject them further in the valley of the Durance. For more than thirty thousand years, each rain corrodes the mountain a litlle more, carving these columns. Each column has its top protected by a stone, called "cap". It consists of a different rock, these granite stones that are resistant enough to protect the column. The column does not collapse under the weight of the hat, simply because it is compressed under the weight of this volcanic stone, and it acquires resistance. These columns are scarce in Europe because it is a rather rare phenomenon. A walk in the southern department of Hautes-Alpes between Savines-le-lac and Le-Sauze-du-lac wouls allow you to meet these ladies, more majestic the one than the other and to discover, nearby, the lake of Serre-Ponçon, the largest artificial lake in Europe. In Theus, some of these old girls are eighteen thousand years old and a hiking trail winds for more than seven miles at the feet of the Demoiselles (The Lady with the beret, the Mother and Daughter...). The hikers will find a second path to approach the columns by starting from the top of the mountain. The ride can be completed by car between Theus and Remollon for a breathtaking view on the site. This viewpoint, called "Ballroom of the capped ladies" because of the large number of rock columns visible from there, will give you the opportunity to salute these ladies one more time before retiring. Info: Offering an outdoor pool and a restaurant, Hotel Club Les Hyvans is located in Chorges on the shore of Serre-Ponçon Lake. Free WiFi access is available in this hotel. Info: Set in a stone country house, La Méridienne sits right on the St-James Way, in the middle of a 2-hectare park. An outdoor swimming pool features on site, and free Wi-Fi is provided throughout the property. There is also a 5000 m² garden.